Self Storage is a relatively recent service industry in the UK. Self Storage centres have a selection of room sizes that you can hire from a locker up to the size of a tennis court or larger, short or long term. You bring your goods or possessions to the storage centre, lock them in the room and come and go as you please during opening hours. You are the only key holder. You can store almost anything unless it is perishable, live or flammable. The best way to find out how Self Storage works at Safestore is to drop into any of our storage centres. To find the most convenient storage centre you can use the location finder on this website. All our storage centres have a fully trained team who would be delighted to show you around and answer any queries and questions you might have. If it's not convenient to drop in please don't hesitate to contact us by telephone or email. Safestore is the UK’s No.1 for choice for self storage with over 100 storage centres nationwide, for all your local home and business storage needs. We also have a further 25 stores trading as Une Piece en Plus in Paris. Our trained, professional and helpful staff and our 30 years experience in Self Storage will ensure that you receive the best service and value in the industry. How does Self Storage at Safestore work? You can store your goods or possessions from as little as a week for as long as you need. Storage rooms can be booked in advance to make sure the size you require is available on the day you need it. You can also easily switch to a smaller or larger room whilst in storage if you need to. 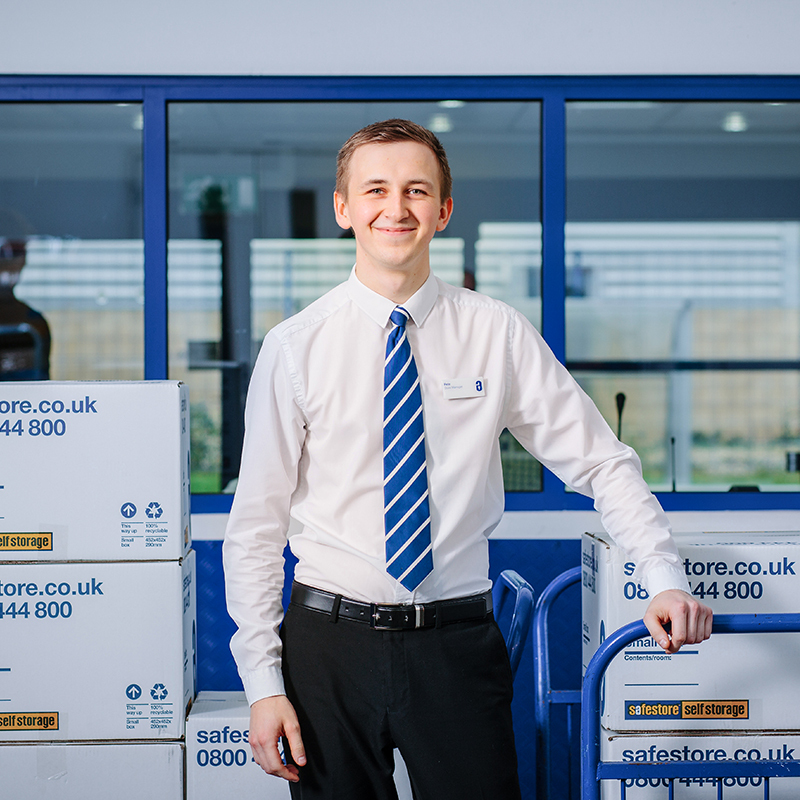 Self storage at Safestore is flexible, secure and hassle free, in fact it couldn’t be any easier, our one-stop-shop approach means our storage experts will deal with any problem you might have. All our people are trained to help and advise you to make sure you get the best service and value for money. What kind of security is in Safestore's stores? Sophisticated alarm systems which are unset and set during trading hours by Safestore staff and outside of trading hours all intruder alarms are monitored by Secom PLC. A fire alarm system which is monitored by Secom during and out of opening hours. Access to our storage centres is strictly controlled. Also, you are the only one with access to your room, which is locked with a padlock owned by you. Yes, you need your own padlock to ensure that you are the sole key holder for your room and to ensure that your room is securely locked at all times. Safestore stock full range of high security padlocks in all of our stores. How much does it cost to store with Safestore? The price you pay is determined by the size of the room you need. That's why our commitment to you is that we will get you into the smallest space possible. As the rental charge is calculated according to the floor area of the storage room, the smaller the floor area the less you end up paying. - What sort of access you will need since you may want to leave a walkway through the storage room to get to your possessions. We can advise you on how to stack your goods and possessions to make maximum use of the space. In the meantime, if you would like to get a rough idea of how much space you might need, you can use the size estimator on our Website. The minimum rental period is one week. You can store for as long as you want, there is no maximum rental period. What is included in the price - are there any hidden extras? The price for storage you are quoted includes VAT. You will need a padlock to secure your room and your goods will need to be insured whilst they are in storage. Please ask in store or over the phone for a quote on insurance, this will depend on the value of your goods to be stored. Yes, we normally offer a range of discounts including: weeks free storage; pre-pay discount; discount for students; discount for online merchandise purchases. However, the offers may change store by store, offers for stores can be found on the store location page of the website. Or you can call the storage centre to find out the best deal for you. We'll invoice you on a four weekly basis, payable in advance. However, we only ask for fourteen days notice when you vacate your room and we refund to you any unused storage charges. You are welcome to stay as long as you require. You can move in on the same day as you make your enquiry (during office opening hours) providing that you have the relevant documentation needed to complete and sign your contract. Two forms of ID are required one of which must be a photo ID (passport or driving licence, for non UK citizens a passport will be required) and a utility bill less than 3 months old. Payment of a deposit and the first invoice must be made prior to moving in. Please check with the store team. Two forms of ID are required one of which must be a photo ID (passport or driving licence); for non UK citizens a passport or UK driving licence will be required) and a utility bill less than 3 months old. Payment of a deposit and the first invoice must be made prior to moving in. Please check with the store team. Most of our customers choose to pay by Direct Debit. However, we also accept credit and debit cards. Your goods must be insured whilst in storage. Safestore offers insurance protection under our own insurance policy. We always take good care of our stores and make every effort to protect items being stored with us. Unfortunately there are some events which may damage your goods which are out of our control, such as a fire or flood. It is therefore standard practice for self storage companies to require their customers to adequately insure their goods for the duration of their stay. Can I transfer to another room if I need more or less space? You can easily move to another size room at any time, depending on your storage requirements and the availability of other room sizes in the store. How often can I have access to my goods? You can come and go as you please, 7 days a week during the store opening hours. Some stores have rooms with access 24 hours. You have to bring your belongings to the storage centre. All our centres have ample car parking and large loading/unloading areas. Alternatively, we can recommend van hire with our partner Europcar at preferential rates or a local removal company to help you with your transportation. Call the Europcar direct booking line 0871 384 9623 and quote the Safestore ID "44824965 ” to get your preferential rate. Depending upon the Safestore store you choose the rooms range from 7 to 9 ft in height. Do you have trolleys or forklifts available? All stores have trolleys and pallet trucks available free of charge for customers use. We also have forklifts available in many of our stores, which can be operated on your behalf by one of our trained staff. How does Safestore's Lowest Price Guarantee work? The Safestore Lowest Price Guarantee (LPG) is simple: we will beat any local comparable quote if it's cheaper and presented to us within 28 days of moving in by 10% for the first 8 weeks and match it thereafter. We will also match any introductory offers and insurance (comparable perils). This offer applies to individual self storage rooms of the same size as the competitor (not container storage) within a 3 mile radius of the store inside the M25 and within a 5 mile radius throughout the rest of the UK. Price comparisons are for the total storage charge including VAT based on a 4 week stay. Safestore reserve the right to increase the LPG price after 90 days. Our Lowest Price Guarantee is currently available to most UK Safestores. Click here for a list of the stores that are not currently offering the LPG and those that are only offering LPG on selected units. This list is subject to change and we reserve the right to remove this offer at any time. Do you offer storage for business? Yes, we offer flexible contracts for short or long term Self Storage. There is no minimum stay. We guarantee our business customers the best business rates available. Please contact the storage centre for details. Do you have office facilities? What if I have booked and my plans are delayed? That is no problem just let us know about the changes and we will extend your booking. We have online booking available at selected storage centres. However, you can book a unit by calling your selected self storage centre directly. Can I store in a number of stores? Can I change the storage centre? You can move to another one of our storage centres as you wish subject to availability. Remember you will be responsible for moving your own items from one centre to another. Everyone loses things from time to time and if you lose your key it’s not the end of the world. Once your identity has been confirmed, Safestore will cut the lock from your storage room so you are able to access it immediately. It will be necessary to acquire a new lock for your room after this, so it is advised that this is only a last resort option. What is the procedure for entering and exiting Safestore premises? Customers are required to sign in and out of the premises or use their issued electronic fob to gain access during opening hours. The electronic fobs should be used out of normal opening hours where customers have pre-arranged 24 hour access. How does Safestore verify my identity? You must provide original documents, not photocopies, and one form of identification must contain a verified photograph, such as a passport or driver’s licence. All identity verification is done face to face, never over the phone or by email, as your identity cannot be fully confirmed by these methods. Photographs are taken by web cam and retained on file once your rental contract is signed. These images require full view of your face and cannot include any family or colleagues; only the person signing the contract is allowed in the image. A new web cam image will be taken with every new contract that is signed to maintain an up-to-date identification process. This is so that new or covering staff are able to easily identify you as Safestore clients and maintain the overall security of the Safestore premises for all our customers. Can I add an additional named contact for access? You are able to give access to your room to family/friends/colleagues but their details must be added to your contract in advance and their identity verified as above. Can I take out my own insurance? It is a condition of storing with Safestore that customers must be insured. You have the option of arranging your own insurance, however your policy must provide cover to the same high level as the Safestore insurance policy. The Safestore store address(es) where you are storing your goods;. Fire, lightening, explosion, earthquake, storm, flood, escape of water from any apparatus, theft by violent or forcible means, subsidence, riot and civil commotion, malicious damage, impact by vehicles, aircraft or aerial devices, vermin damage, collapse or partial collapse of building. The Safestore address where they are storing their goods. Safestore customers choosing to supply their own coverage must ensure that, at a minimum, it covers the same “Insured Perils” as detailed in the Safestore T&C’s. Safestore will need to take a copy of your insurance policy and retain this on file with your rental agreement. These documents will need to be supplied annually to Safestore as they expire. What happens if I do not have the required documents? If you are not able to provide the above documentation at the time of signing up to store with us, we will automatically charge you for the applicable insurance charges based upon the value you have declared. You will then have a period of 14 days to provide the required information and sign our declaration to qualify for a full refund of any insurance fees charges to date. Can Safestore recommend insurance providers? Safestore team members are not able to recommend insurance providers or make personal assessments of whether or not insurance is suitable for your needs. What is the minimum insurance required? All items placed in storage with us must be insured for their full replacement value on a ‘new for old’ basis. What can the Safestore insurance policy cover? Please read our Insurance Cover Information Document for a more detailed summary of the cover available. Safestore’s Customers’ Goods policy is underwritten by Allianz Insurance. How do I benefit from the cover? You are required to accept the appropriate option shown on Safestore’s licence agreement, check that you have inserted a correct valuation for your property and to pay all charges in full. In respect of Business Customers’ stock and work-in-progress, you must declare the current replacement value for all property being stored, taking into consideration the age, quality, degree of use and consequent market value of your property when calculating the settlement. In respect of all other customers, you must declare the current new replacement value of all property being stored. This means the cost to replace your items with a new equivalent, not the price you paid when you purchased each item. The costs required to reproduce any information recorded. You do not need to include the value of the information contained in any documentation lost or damaged, as this is not covered. Please do not ask your Safestore for guidance about your valuation. They are not valuers, and the responsibility for declaring the value is yours. Remember that you must declare the full value of the goods being stored or you will be underinsured. This means any claim would be subject to Underinsurance as per Clauses 5 and 6 within the Insurance Cover Information Document and any claim settlement would be proportionately reduced. For example, if you declare a value of £25,000, but your goods are actually worth £50,000, you are underinsured by 50% and all claims will be proportionately reduced. Why do I need to contact you to find out the price of your insurance? We don’t know the true replacement value of the items that you’re storing and we can’t estimate the true replacement value to calculate the appropriate charges, so you’ll get a better idea of the cost if you contact us directly. We always cooperate with the Police and HM Customs.